St. Louis Southwestern Railway, better known as The Cotton Belt had some lovely 4-8-4 dual service locomotives. 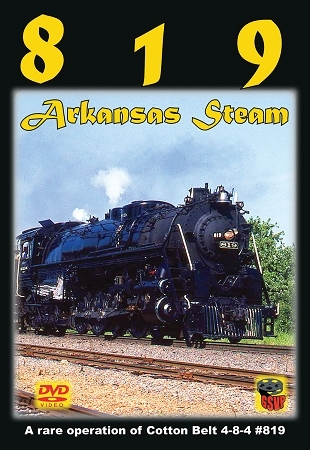 One such locomotive number 819 was given to the city of Pine Bluff, Arkansas and was restored back to operating condition in 1986. The engine was only used for a few special appearances over the course of 2-3 years. So at the urging of one of our customers we made a trip to Arkansas for the once per year event held in Fordyce, Arkansas. The day before the run, we are at the Cotton Belt shop where 819 was restored and kept. We then see the preparations, and the fire-up. Then we view action shots of the train running from Pine Bluff to Fordyce. We see it cross the Saline River bridge, and a photo runby among other shots. There is a day off between the two runs, and Sunday we are back at Fordyce. The engine is pulled out of the siding along with the passenger coaches. The train has to head southwest to a wye where the engine will be turned for the trip back to Pine Bluff. This allows us a couple of extra shots. We then chase the train back to Pine Bluff which includes a brief pacing scene. This was all shot during April of 1988. This was trackage owned by Southern Pacific.